If the previous page made the game sound interesting then it's time for me to disappoint you. My World My Way falls short of the mark in several places. Firstly and most importantly is the actual gameplay. For a game that promised "no grinding" there's certainly a lot of boring, repetitive combat to slog through. Many quests will require you to go and hunt monsters but worse still are the ones that ask you to find items dropped by monsters. Sometimes you're required to slay dozens of the same kind of monster just looking for a specific item. One quest even had us finding five items like this, during which we nearly lost the will to live, let alone carry on with the game. You can pout and get the monsters to drop more treasure once slain, but you can't ask for a specific item. Furthermore, the option to pout your way out of a quest entirely is not available until much later in the game and even then doing so means you'll suffer a permanent reduction in the number of pouting points you currently have. There's plenty of other little niggles too. The graphics are perfectly charming when you're in a village, but venture out into the field and the beautiful princess tuns into a barely recognisable mess of a 3D model. The game doesn't make good use of the DS's features. Stylus control is possible but the games menus and options are actually easier to navigate with the D-pad. 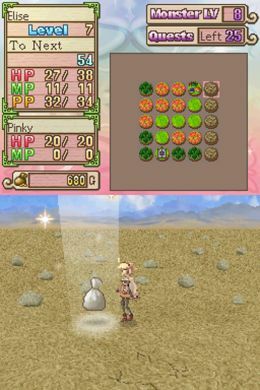 Both screens are used in combat and out in the field, but return to a village and instead of displaying your currently equipped items or other useful information, the top screen simply goes blank. We'd have liked to have seen a little more time spent on presentation too. Being able to actually see the princess and her blob during combat would have helped and some funny animations for when she starts pouting would have gone some way to livening up the repetitive combat. Even the reasonably well drawn townsfolk that the princess encounters are all carbon copies of each other, which is presented as something of a joke in the games script, but it's not one that is particularly funny. There are other problems too, like the repetitive unrewarding combat, the way weapons feel unbalanced compared to magic and the fact that learning new spells is another chore (you have to get hit with a spell before your parrot can learn it for you). You should get the message by now though, My World My Way is far from perfect. In spite of it's many flaws however, the game is tolerable in short bursts. The story isn't fantastic, but while the princess is spoilt she's also childishly naïve. This naivety prevents her character from being too obnoxious and the games script never takes itself very seriously. Even if you like the idea of adventuring with a princess and her blob, however, there are far better ways to spend your time and your money than slogging your way through this uninspiring adventure. If you rushed out to buy this game, try pouting as you ask for your money back and then spend it on something else.